I penned my first article when I was in middle school. When I saw my first byline in the Pipkin Pirates Newsletter, I was hooked. After that, I took several writing classes in high school and college and wrote mainly non-fiction while in marketing—specifically about healthcare, banking and green heat. As a fiction writer, I’ve been writing professionally since 2010. Q. What genres do you write? I write children’s picture books, women’s fiction, contemporary romance and have a romantic suspense partially drafted. I also enjoy writing short stories, six-word memoirs, and haiku. I have eclectic taste when it comes to trying out various genres. I love them all! Q. What is Women’s Fiction? Women’s Fiction focuses more on female friendships and bonds than the male/female relationship. Usually meaty subjects are handled and the women overcome obstacles and become stronger for it. 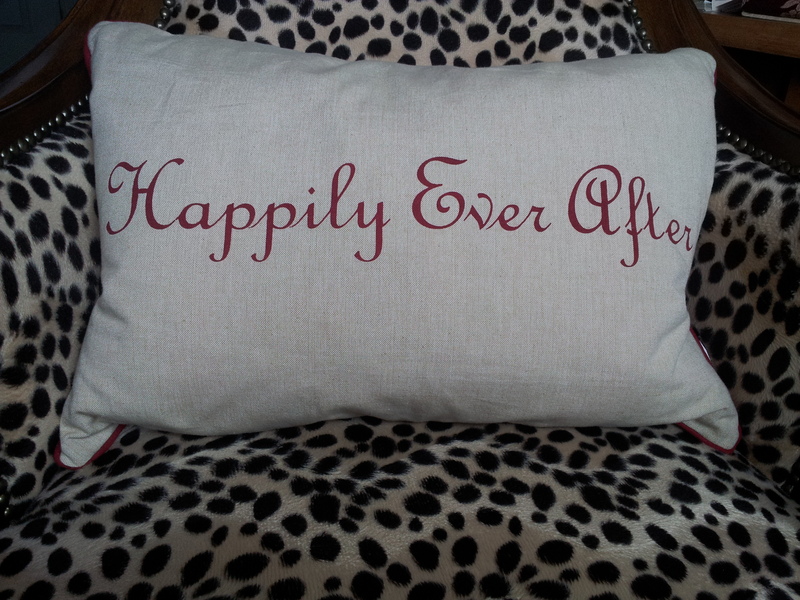 However, while I love reading and writing women’s fiction, I also love a HEA (happily ever after) so I will almost always incorporate that in my women’s fiction. Males appear in my novels but are not the core characters. I also enjoy writing humor and suspense and pepper my novels with those aspects as well. Women’s fiction doesn’t have zombies or werewolves and is set during modern times. It’s also different from Chick Lit. Chick Lit, while fun to read, is often more light in tone than Women’s Fiction which tends to tackle hard subjects like grief, depression and infertility, for example. Q. What genres do you read? I read women’s fiction, contemporary romance, romantic suspense and thrillers. Of course, I loved reading children’s picture books to my toddler daughter and now get to read them to our grandchildren. That’s impossible. There are so many. The ones that touched my soul are SOUNDER and A RAISIN IN THE SUN. I had to read those books and several others in an African-American Literature class in college and they changed me forever. AN INVISIBLE THREAD also impacted me. It’s a true story about a busy New York City exec who befriends a little homeless boy. They’re still friends to this day. I also love reading most anything by James Patterson and Harlan Coben, thus my love for writing suspenseful scenes! As I child, I adored the LITTLE HOUSE ON THE PRAIRIE series, The Boxcar Children and Charlotte’s Web. Q. Where do you get your ideas for novels? Many places. I can hear one word or see a color and I go off on a tangent. The “ripped from the headlines” stories make great fodder, too. I also love first-sentence prompts and photo prompts. It’s amazing how one kernel of an idea can germinate into a 350-page novel. Sometimes, my work is more character driven. I might want to torture a hateful person (on paper, of course!) or I might see a unique person at a coffee shop who would make a great character. Q. I see you also write children’s books. Where do you get your ideas for children’s books? My ideas come mainly from my imagination and the desire to tell a fun, uplifting story for children and parents. Two of my children’s books are written in verse and two are not. 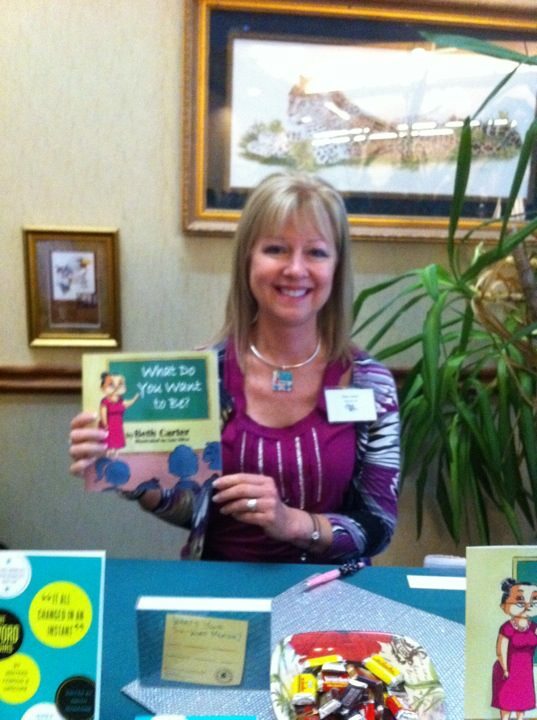 When I wrote my first picture book, WHAT DO YOU WANT TO BE?, our country was in a terrible economic downturn. I thought if kids heard parents, relatives or neighbors talking about losing their jobs, they’d surely be concerned about their own future. Kids are little sponges. I wanted to inspire them to dream big. During one book signing, I was thrilled when an elementary school counselor bought this book and then came back to buy four more for her fellow school counselors. I was beyond touched and honored. In THE MISSING KEY, my mom inspired me. She is always losing things! Haha. We can all relate to that. Mother chants “Me oh my. My oh me” as she and her daughter turn the house upside down looking for the missing key. Amy fears she won’t be able to go to the fair until they find it so it’s a whirlwind task. SANTA’S SECRET was created when I was at the beach around the holidays. It just didn’t feel like Christmas to me since I’m a Midwestern girl where it’s chilly in December and often snows. So, I came up with Grumpy George who just knows Santa won’t visit him at the beach. I also decided Santa needed a secret! Who doesn’t love secrets?! My newest picture book is called SOUR POWER. Look for it this year. It’s about two little boys and includes magic. I guess you could say my daughter subliminally inspired me because she is a dancer and also a magician’s assistant for several talented magicians and illusionists. Who doesn’t love magic? 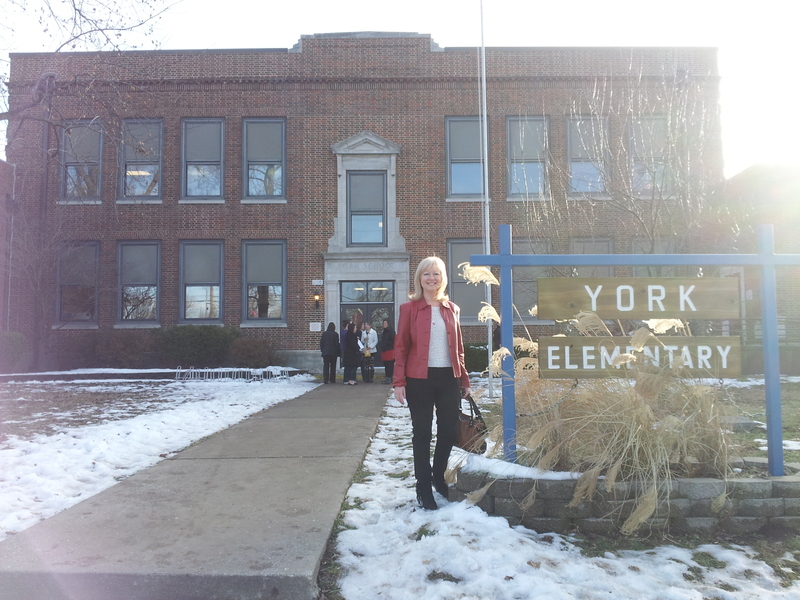 Beth is ready to read to York Elementary students! For me, it’s staying focused. That shiny thing called Facebook gets me every day. I can spend hours on Facebook, Twitter and visiting writers’ blogs. Before I know it, two hours have passed and I haven’t written nor edited a thing. I get really angry with myself but social networking has been good to me, too, so it’s a balancing act. Q. Do you write from home, a coffee shop or somewhere else? The majority of time I write from home—either in my upstairs office or at the kitchen table (it’s closer to the coffee pot!) 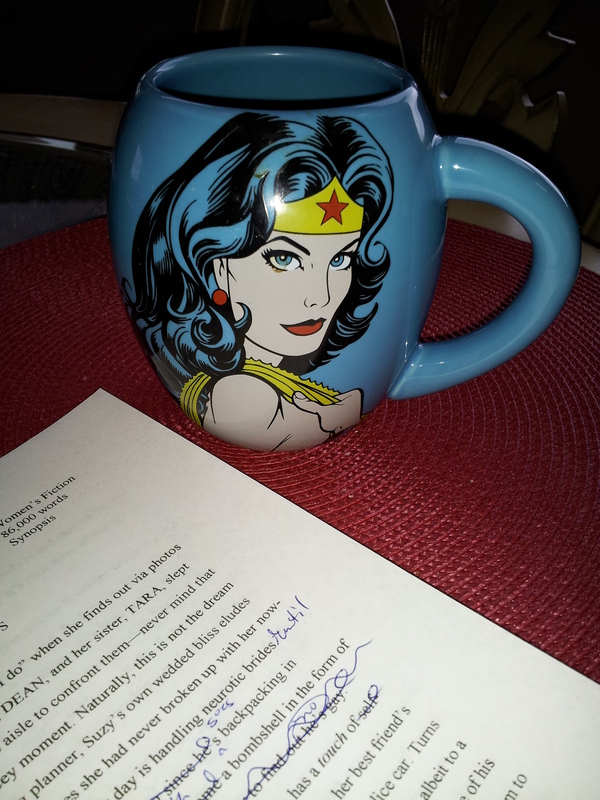 I adore this Wonder Woman mug. I drink out of it when I need to channel my internal super powers. Writing is a solitary career and I’m a social person, so when I need to see people, I write at the Barnes & Noble Café or at Starbucks, though I prefer quiet while writing. Occasionally, I enjoy having a write-in with a writer or two. It’s motivational to have dueling laptops. Q. What is the hardest part about writing novels? Making myself do it and avoiding social networking, as I said earlier. Also, that thing called the sagging middle. About 100 pages in, I can really rock and roll and also the last 100 pages go more quickly because I’m tying up loose ends and my characters are often surprising me, which is delightful. But the middle 100 pages are hard, thus the name, “sagging middle.” The way around that (for me) is to include plot twists and introduce a secondary character or two. Getting my characters to zig when they’d rather zag is great fun. That said, the characters usually have the final word. Q. What is the hardest part about writing children’s picture books? Picture books look deceptively easy to write since they are short, but they are not. It’s hard to tell a story from beginning, middle and end under 1,000 words. It’s also important to have some conflict, use of the five senses and a satisfactory resolution. When editing, I write my picture books with an illustrator in mind. Authors have to give illustrators something to work with—curly hair, a buzzing bee, bluebird swooping or something! I also try to use words that are challenging, yet understandable. Finally, my goal is to write enjoyable, timeless stories that children, parents/grandparents will want to read again and again. Q. How do you come up with different characters? Are they based on people you know? The majority of my characters are complete figments of my imagination. Occasionally, I’ll overhear a conversation or see an unusually dressed character who is practically begging me to write about them. Also, I have a few quirky traits that appear in SOME of my characters (hint: especially Alex in THURSDAYS AT COCONUTS). Q. Do you prefer writing about nice characters, quirky ones or the ones we love to hate? Oh, the quirkier the better. The meaner, nastier the better. Those characters are much more fun to write about than someone who is overly sweet and never gets into any trouble. I think I almost have too much fun with them when I get into their heads. Q. How do you choose character names? I sometimes have trouble coming up with names. For some reason, in my debut novel, an editor pointed out that I had FIVE names beginning with “S.” I hadn’t even noticed. So, I changed Sarah to Tara (haha) and Sylvia to Emma. For surnames, I go to the phone book. The old-fashioned, big thick one. It makes it easy if I’m looking for a last name beginning with “G,” for example. Q. Do you use a computer to write or are you old school with a pad and paper? I use all of that—my computer, usually my laptop. I also write on legal pads, bank receipts, envelopes, and in journals—way too many journals—where I’ll scribble out novel ideas or plot points and then lose said journal. Sadly, I’m not very organized when it comes to keeping tabs on my writing. I probably have a great novel tucked away inside one of my many journals. Q. I heard you love six-word memoirs. Describe your writing day using just six words! Coffee. Facebook. Email. Coffee. Blank screen. Q. How do you handle marketing your books? Marketing is very time consuming and most writers hate it. It’s necessary, though, and I probably have an advantage since marketing was my career for over 25 years. I have traditional book signings, blog hops, launch parties and buy author swag to hand out. I promote extensively (but not daily) on social media. Too much promotion is like walking a tight rope. Authors can’t risk being spammy with constant “Buy my book” posts or they’ll lose followers. It’s important to build relationships with readers and potential readers. Let them in. Let them get to know you. Finally, I’m forming a Street Team. I think they’ll be invaluable in helping to spread the word. Q. Do you have book signings? Yes, I’ve had several. My first one was at the grand opening of a locally owned market. For my children’s books, I’ve had signings at cupcake stores and yogurt places. Of course, I’ve also had them at Barnes & Noble and writers’ conferences. It’s a thrill to meet fans of my books. Tip: Think about your target market before scheduling a book signing. Who are your readers? Who are your characters? What is the setting? Q. Do you go to elementary schools for visits? Yes. I love to do this and always leave with a smile wrapped around the back of my head. I’ve read to several kindergarten, first, and second grade classes. After reading my books, I talk to the kids about writing and they always have a million questions. I love their curious minds and excitement. I encourage all authors to do this. They’ll treat you like a rock star! Join writers’ groups. 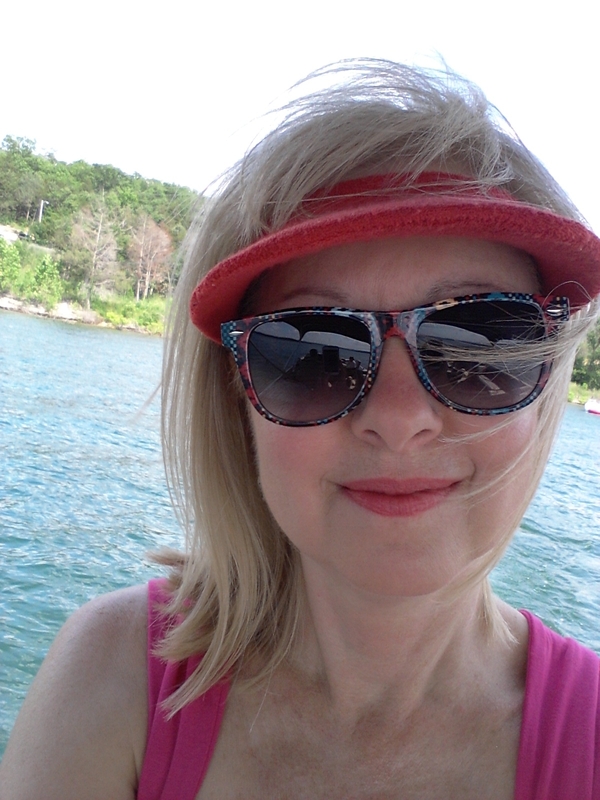 I belong to Ozarks Romance Authors, Sleuths’ Ink Mystery Writers and Ozarks Writers’ League. I also recommend subscribing to Writer’s Digest and The Writer Magazine, and buy books on the craft. Attend professional conferences and get to know seasoned writers, agents and editors. Try using prompts and start small. Sometimes, a novel is too daunting at first. I got started using six-word memoirs. Anthologies are another great way to build your writing credentials. Anthologies often have themes to get you started. Short stories can pack a punch and are often what you need to start a novel. Q. How many books do you write each year? What’s your goal? 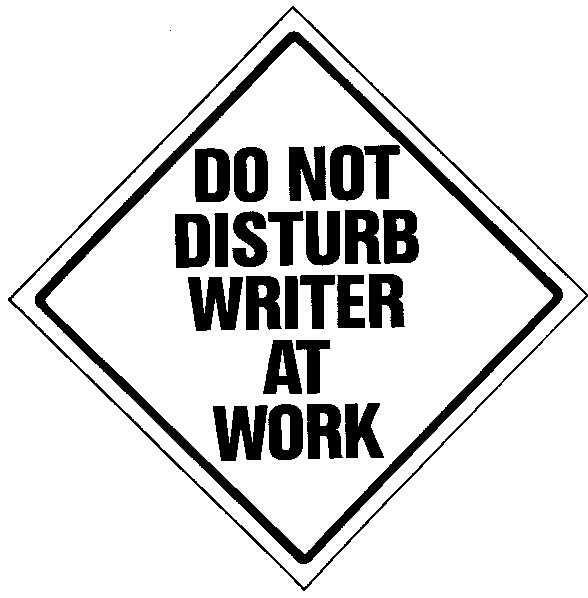 I am not a fast writer nor a fast reader, plus remember that shiny Facebook thing?! 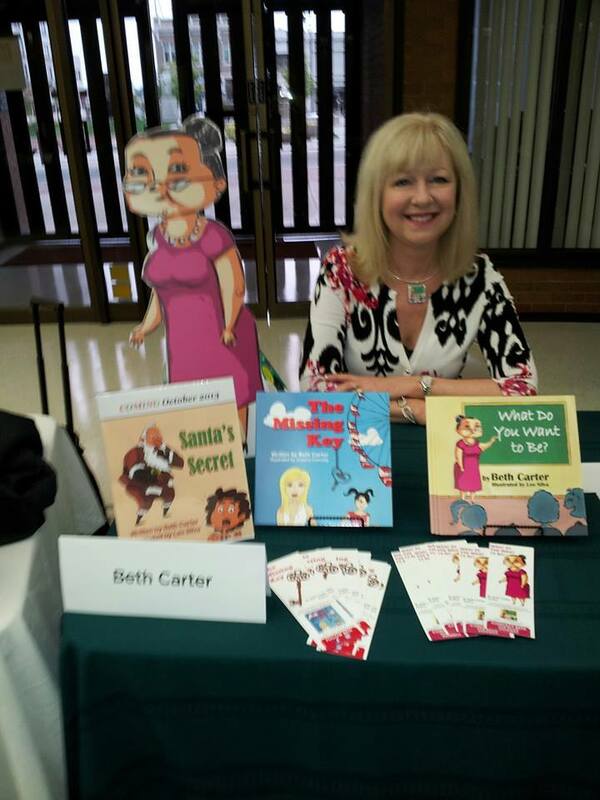 My goal is to write one novel and one children’s book a year. That’s definitely doable. That’s what I keep telling myself anyway. Q. What is a Street Team? How can I join? I’m just finding out about Street Teams myself. We can learn together! Basically, it’s a group of readers who want to help spread the word about an author’s work in exchange for freebies like swag (bookmarks, totes, etc. ), drawings for gifts, and sneak peeks at an author’s work before it’s available to the public. I’m working on my Street Team guidelines here. I’d love to have you as part of my marketing team! They are also online at Barnes & Noble http://bn.com and are Kids’ Club eligible. Want to ask another question? I’d love to hear from you!